When it comes to your business and the services and products you invest in, have you ever inquired about the benefits of managed print services? Optimization is everything when it comes to your growing business, and it’s important to learn all the ways your business can grow, especially when it comes to the technology that keeps your business up and running each day—or can reduce costs. If you haven't heard of managed print services until now, let us explain. Managed print services (also known as MPS) are offered by print providers to help manage your print fleets, such as printers, copiers, and fax machines. Speaking of print tracking, take a look at an article we published on print tracking and how it can support your business, 5 Ways Print Tracking Saves Money and Empowers Better Decisions. As you can tell, there’s a lot that goes into managed print services and the best ways these services can increase the success and growth of your business. 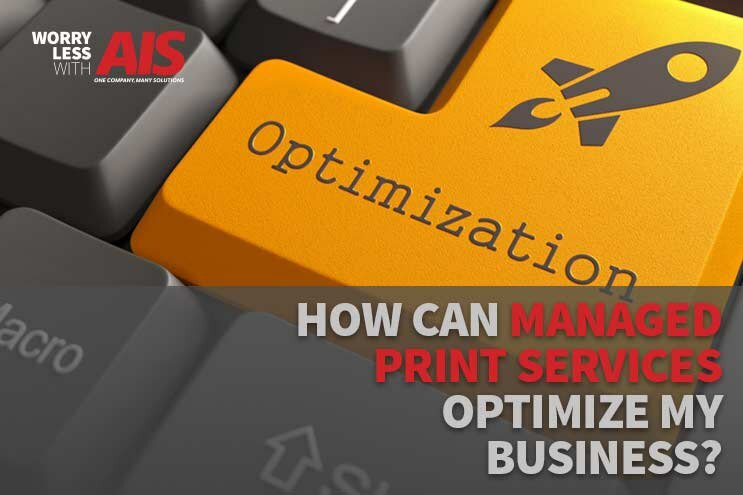 Large or small, a managed print services company is always a great plan to achieving maximum efficiency company-wide, while supporting growth. Learn even more benefits of managed print services by reading an article published by Channel Pro, The Benefits of Managed Print Services. Almost all businesses need to print documents. From invoices and newsletters to sales brochures, proposals, and contracts, most companies have a constant stream of papers flowing from their office copiers and printers. Because of the inherent difficulty in using printers, and the maintenance and troubleshooting that comes with it, a managed print team can alleviate some of this stress you might currently be facing. With that being said, take a look at some of these exceptional advantages of using these management services for achieving maximum optimization of your business. How much printing does your business do on a weekly or even daily basis? Is it a lot? If your company is regularly printing large documents, needed in short amounts of time, managed print services is easily an excellent solution for your business. A managed print services company can work with you and assess the frequency of your print jobs to get you the appropriate office equipment to take on your most significant printing projects. You want peace of mind knowing that your printer won’t break down halfway through the print job, especially when you’re in a bind for time. You also don’t want to be the only person who has the privilege to use the only office copier in the building that works because your project might take priority over others. All departments and employees deserve a high-functioning multifunction printer, no matter the size or urgency of a project. Let’s face it, your workdays are jam-packed, and you’re almost always looking for more hours in the day to get things done. The last thing you need is to worry about the purchasing of supplies or part for your office equipment. No matter what kind of office printer you have, they’ll eventually run out of toner, can be poorly maintained, and sometimes aren’t up for the task. An MPS provider can take care of all of this, and so much more. Let them handle the ordering of your supplies and parts on a routine schedule so that you’ll never be waiting for your supplies to come. The more assessment an MPS does in the beginning, the better understanding they’ll have of the parts and supplies your business needs to function at its best. A commonly overlooked area of business infrastructure expenses is your print fleet. If you don't know how much you're spending on your copiers supplies (prints, toner, paper, and maintenance costs (which can lead to lost productivity as equipment goes down); there's a good chance you're spending more than you need to. By looking at these costs on a monthly and annual basis, even a small adjustment in savings can add a whole lot more to your bottom line. The journey to savings begins with a first step – and that step is a print assessment. The goal of a print assessment is to identify your real print needs and volumes and then provide a recommendation for the mix of copiers, printers, scanners, and fax machines that meet those needs. Based on these results, an MPS provider will get to work for you, creating a combination of hardware, management software, and process that will meet your budget and performance needs. Where are you spending money now? Leases? Maintenance contracts? How many devices do you have in your office? Are these devices optimally placed? Are they placed for efficiency or convenience? Is your printing environment secure? Are documents with confidential information handled appropriately on the devices? Are your machines old, resulting in overconsumption of energy? If you think you might be paying too much to print and copy or that you could use your equipment more effectively, consider a free, no-strings-attached print assessment with a managed print services provider. To learn more on the costs and savings associated with a print assessment, read our article, The Print Assessment: The First Step To Saving Money on Printing Costs. Partnering with a managed print services company is a great way to keep costs down while also focusing on the efficiency of your business processes. At AIS, we strive to answer the questions that not just our current customers are asking, but our prospective customers are asking as well. Our purpose is to equip you with the latest and most helpful information when it comes to your office solutions and business technology systems, based on your business needs and goals. If you’re interested in learning more about managed print services, reach out to one of our business technology consultants, here. We’re here to give you peace of mind, to help you win more business.